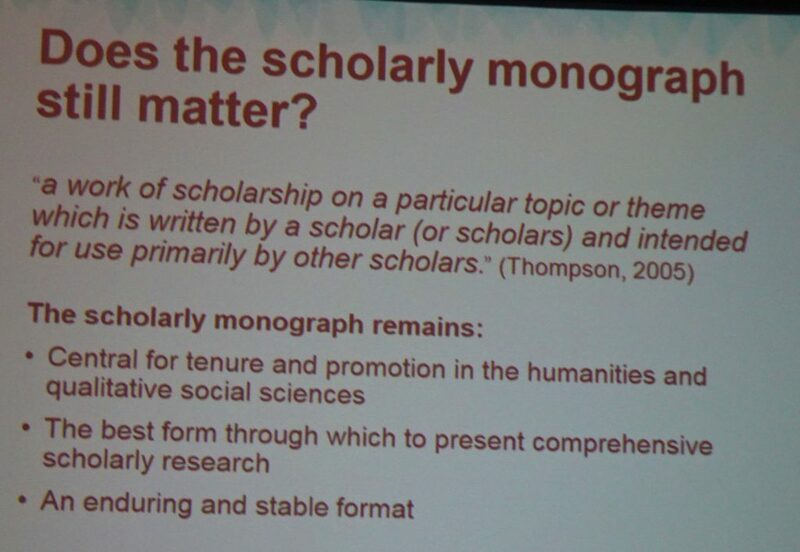 Emily Farrell, Sales Manager, Northeast, De Gruyter, wondered if the scholarly monograph still matters. It is still the central point for tenure and promotion in the humanities and social science. She then discussed the reason for university presses. Their commitment to the integrity of knowledge creation and sharing has a renewed urgency and relevance. If they break even, that is a bonus. They now face problems from digital and related pressures (i.e. OA), diminishing library budgets, and decreasing sales per title . But publication costs remain high (one study reported between $15,000 and $130,000). The situation is not a crisis, but conditions are changing. Acquisitions editors should be brought into the publication process because they exert editorial judgement in finding manuscripts that fit the press’s mission, which is closely tied to the reputation and character of the press. Kizer Walker, Director of Collections, Cornell University, pointed to the need to understand possibilities between dynamics, suggesting an erosion of publishing channels. Many presses are forced to turn away manuscripts. 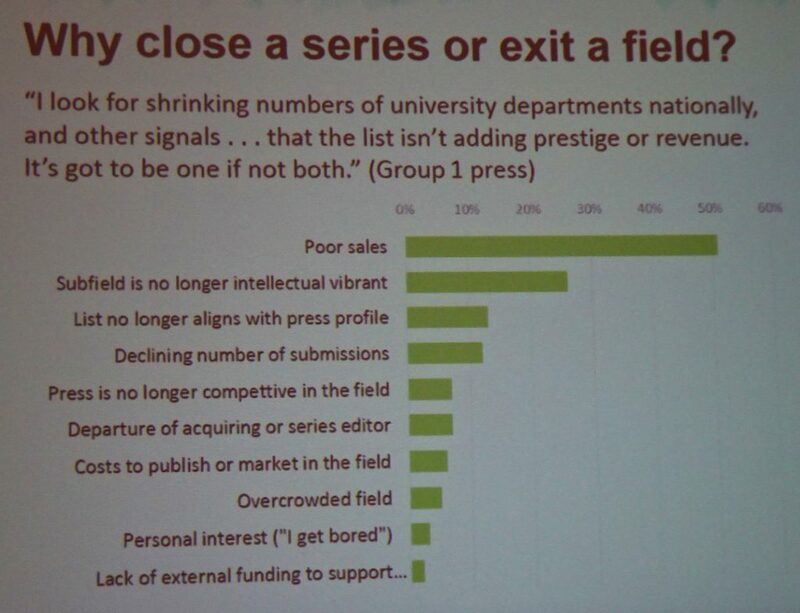 The Association of University Presses (AUP) did a survey to determine how economic pressures on university presses are affecting monograph publication and whether guidelines, incentives, priorities, and workflows for Acquisitions Editors are changing in an era of declining sales. 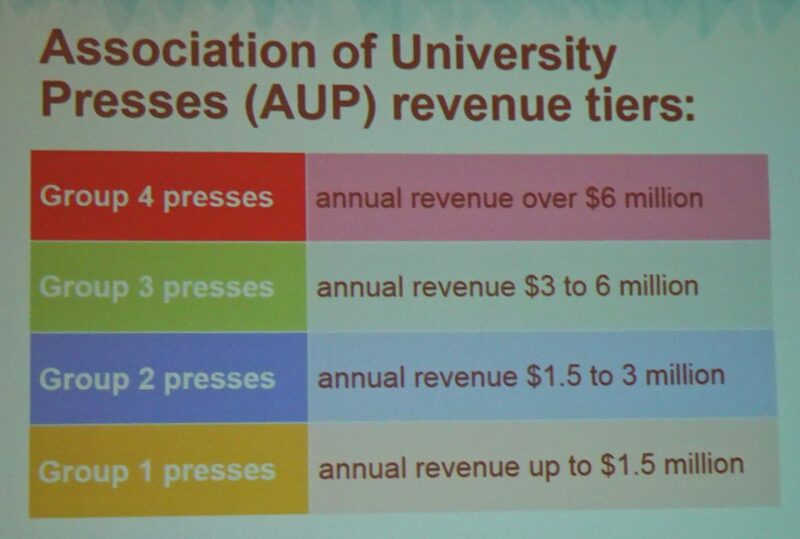 The study found these revenue tiers from at least 23 presses. 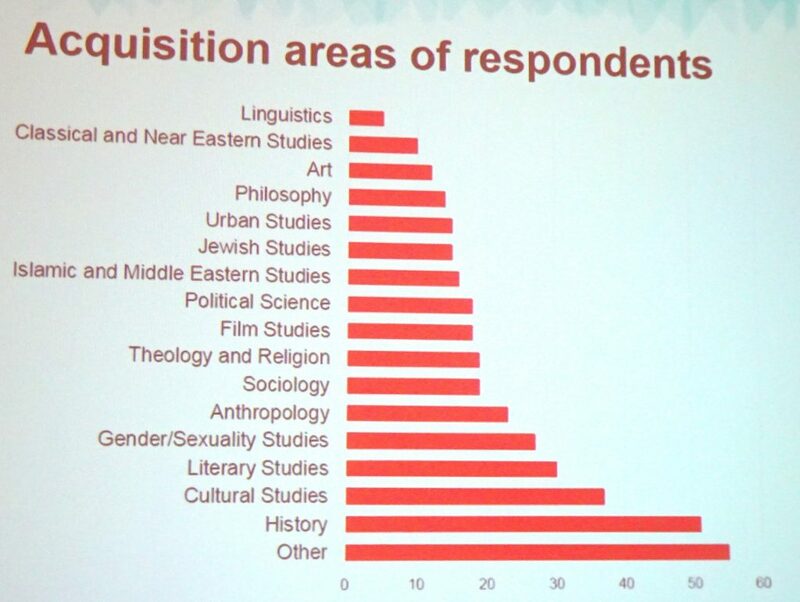 Here are the subject areas acquired. Sales have dropped sharply (35-60%) in the last few years. Ebook sales are a small fraction of sales (most are less than 20%). About half of the 23 publishers said they are not acquiring OA monographs. 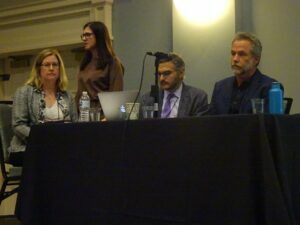 Mahinder Kingra, Editor in Chief, Cornell University Press, said that many Acquisitions Editors have worked for many years. Their performance assessment criteria have recently changed to include an increased focus on revenues and costs, more focus on acquiring trade and text books, introduction of quantitative measures, and expectations that the editors will handle more books. The work of Acquisitions Editors is that of a gate keeper to evaluate book proposals. Reasons for rejection include the quality and scope of the proposal and the sales potential of the book. Every acceptance is a commitment of $20,000. Subsidies are a key part of acceptances (31% of books come with some subsidies, usually from the author’s institution). 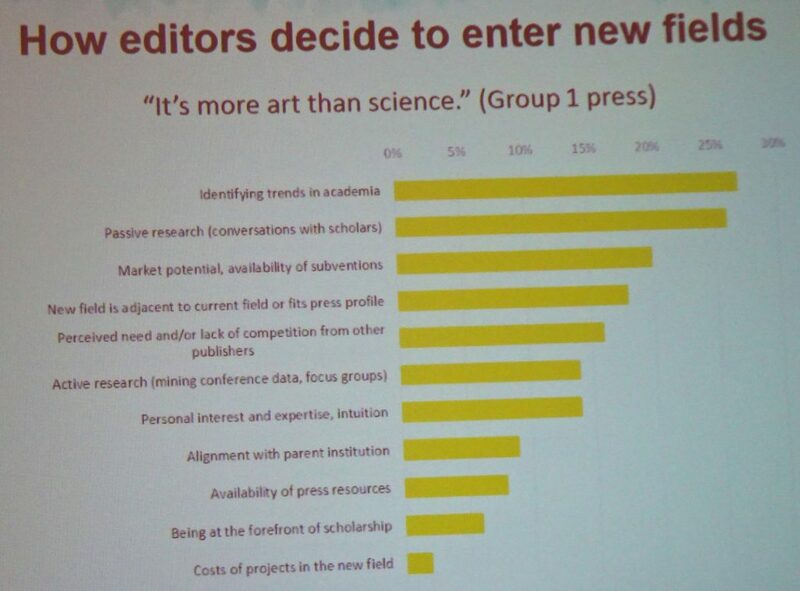 This graph shows some reasons editors use in deciding to enter new fields. The cost of entering is not usually considered. Factors considered in launching a new series include increased funding, more proposals, a sales proposal or a suggestion from authors, and an emerging new field. Here are some reasons to close a series or exit a field. Poor sales is by far the leading reason. Editors analyze a lot of data; not all of it is quantitative. 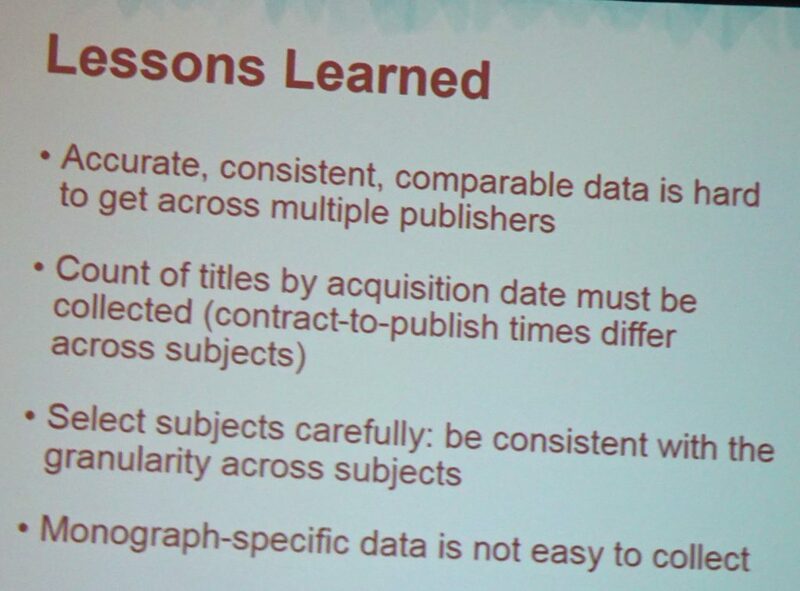 Nicole Kendzejeski, Associate Director, Project MUSE, described how she does correlation analyses to determine if there is a relationship between revenue and the numbers of new titles acquired in that subject in the same year? She found that there is, but each subject area looks different from others. Ultimately there is a positive correlation between acquisitions and sales for several subjects. Here are her lessons learned. The mission still wins. Editors will find a way to “support the continuation of important scholarly research”. To answer the question asked in this session, Acquisitions Editors are still shepherding scholarly monographs through to publication regardless of sales potential, but sustainability under current models is doubtful, and new production and distribution methods seem underutilized. New economic models are emerging but have yet to take hold. The overall picture is still a little unclear.